POWERING BRANDS: Pepsi IPL Goes Social. Oh. Yes. Abhi. Pepsi IPL Goes Social. Oh. Yes. Abhi. Since acquiring title sponsorship, Pepsi has gone all out this IPL with its new ‘Oh. Yes. Abhi.’ campaign to create maximum buzz. New ad spots and contests tailored for the tournament, a new Fan Can and UTC promo, ensure it creates engagement with its target audience throughout the IPL season - which is also a perfect seasonality fit. Digital is playing a big part in the executions, especially contests which leverage Pepsi’s social media presence. The tiled Oh.Yes. Abhi. campaign landing page brings together the latest IPL scores, contest leader-boards, details of the UTC promotion ‘VIP Box Ka VIP’, IPL Tweets and the latest TV commercials. There are 2 live contests. The big one is ‘Pepsi IPL Ka Boss’ where Fans need to login via Facebook and score points for engaging with brand content by sharing & liking, inviting friends, following Pepsi channels on Twitter & Pinterest. The top scorers get to win prizes like match tickets, VIP box passes and limited edition branded merchandise. This is Pepsi’s hunt for its biggest social fan. Tweet20 is another interesting contest that employs Twitter integration. 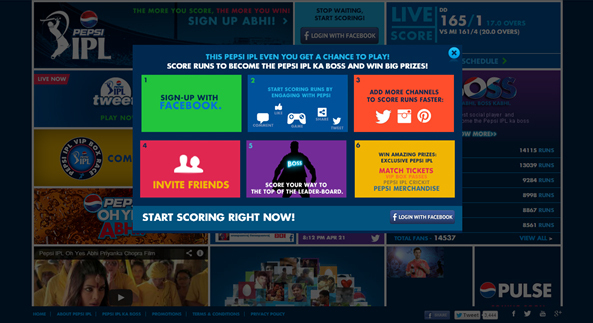 Fans need to sign in via Twitter, follow @PepsiIndia, choose an IPL team and play the game through tweets. VIP box passes are up for grabs. All contests have special video guides that explain what needs to be done. Pepsi pioneered this sort of custom content created for the web more than half a decade back. The brand doesn't disappoint and is doing a great job on social media by keeping the content fresh and therefore engaging.